New class members of Southwest Colorado Accelerator Program for Entrepreneurs, Eric Sioris and Cynthia Johnson, discuss plans of their new business, TimePro, which aims to provide part-time executive assistants to small firms. 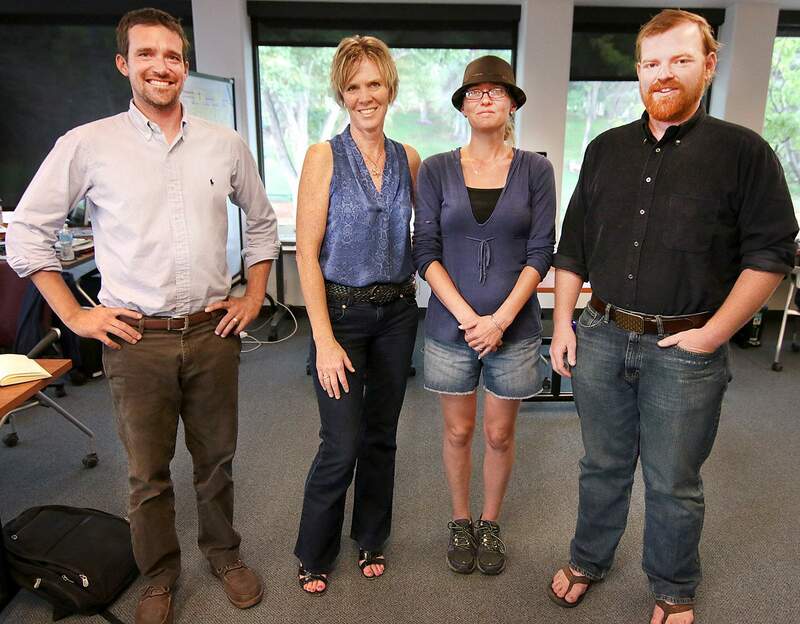 A Durango business accelerator program has three members in its latest class. Two of the fledgling businesses offer services that seek to create more time for busy professionals, while the third wants to help you bake a decent gluten-free cupcake. The class began July 14 and ends with a pitch to potential investors Nov. 19. 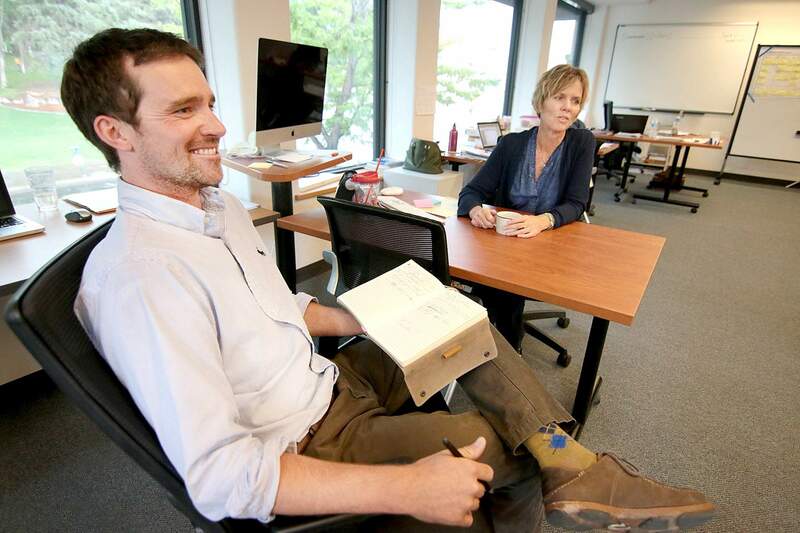 The class is the third for the Southwest Colorado Accelerator Program for Entrepreneurs, or SCAPE, founded in 2013. First, the cupcakes. Durango Farmers Market customers may be familiar with Kokopelli Baking Co., run by Amber Davis, and her mother, Kari Sample. Davis is offering baking mixes that do not contain gluten, a mixture of proteins found in wheat and other grains that some people find problematic. She’s busy baking batches to perfect the mixtures, which may use sorghum, tapioca, potato starch and xantham gum instead of gluten. Davis has been handing out samples at the Farmers Market. She sells 1-pound bags of the baking mix for $8 to $11, although she’s considering dropping prices. She credited the SCAPE program with providing guidance. “The business model has already helped me avoid very costly mistakes,” she said. As with many entrepreneurs, the toughest task she’s faced is a lack of readily available money. Another business, Project Pinnacle, aims to make life easier for professional photographers with a Web-based platform to manage their photo editing, customer interface, portfolios and marketing. The business was started by Chad Wallace and Greg Thomas, who worked together on Telluride Festivarian, a free magazine distributed in the area that covers major festivals. “We want to make it so the photographer can spend more time behind the lens and less time behind a desk trying to pull it off,” Wallace said. TimePro is a working name for a business started by Eric Sirois and Cynthia Johnson. The business will offer part-time executive assistants to small businesses and entrepreneurs. Sirois started and recently sold Durango Rent-A-Man to his business partner, while Johnson quit her job as a designer and executive assistant at Durango Marble & Granite to work on TimePro. The pair envision TimePro having a national or even international reach. They plan to expand to Denver as soon as possible. “Go big or go home, right?” Sirois said. Sirois and Johnson think there is a ready market of businesses looking for experienced executive assistants. “Our goal is to help busy people, busy professionals, have more time,” Sirois said. Johnson said TimePro executive assistants could have a chance to make more money. The three businesses are working out of SCAPE’s office at 1211 Main Ave., Suite 1. Elizabeth Marsh, director of SCAPE, said the entrepreneurs share a common trait.